Beer number 35 in this challenge we owe to my lovely girlfriend Lizzie, who just bought me a case of this beer. Iceland has a relatively short brewing history, but have a holiday called "Beer Day" celebrated on the 1st of March every year. Beer Day celebrates the 1989 lifting of prohibition in Iceland. Until the Icelandic economy crashed in 2008, the country had the most expensive pint of beer in Europe. This changed very suddenly however, within 3 months the average Icelandic pint was Europe's 2nd cheapest! Viking is the countries highest selling beer, and is apparently similar in taste to Carlsberg. Icelandic beer was drunk even while it was prohibitively expensive because of the very high standard of water used in the brewing, apparently it's still the case! 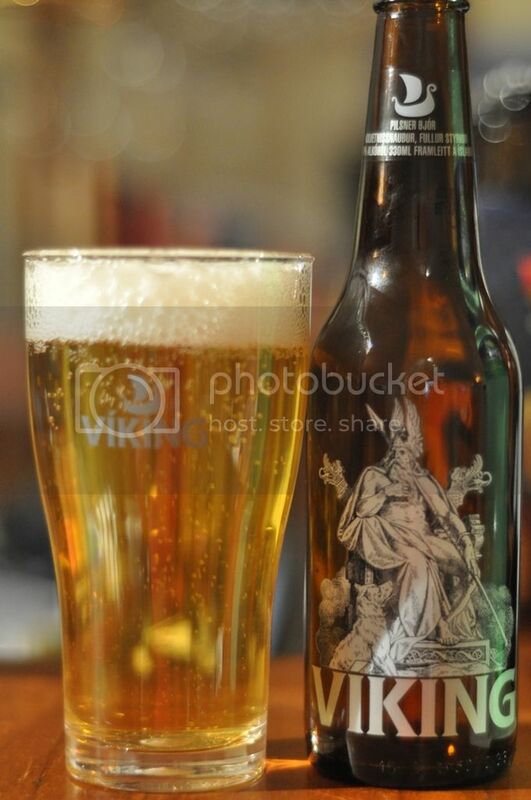 Viking Lager pours a clear yellow colour with a slightly smaller than usual white airy head. Despite the airy nature of this head, it has excellent retention. The beer laces the glass brilliantly, it's some of the best lacing I've ever seen actually, possibly only topped by Emerson's Pilsner. Theres heaps of rising carbonation in this beer as you can see in the photo. It's a very impressive looking lager. The smell reminds me incredibly of Carlton Draught, but more refined. It's a mostly grainy smell with some bready malts. There is some good bitterness provided by some grassy hops. The grainy smell however is so strong, it's quite hard to determine anything else. For what I'm feeling like now this could quite possibly be the perfect beer, if it tastes like it smells. Viking Pilsner Bjor to give it it's full name, is a fantastic lager! For all of my Australian followers this is Carlton Draught on tap, but even better! For everyone else, this is a grainy style lager with moderate-high carbonation. There are some bready malts present and some spicy and grassy hops. Basically though it is an excellent slightly bitter grainy beer. However it's refreshing and delicious! This is one of the more refreshing lagers I've ever had. Whilst it has a grainy flavour it is actually more than just your standard beer. There is a subtlety to this beer that you wouldn't expect from your average macro lager. It's crisp and refreshing and surprisingly good. Who would have thought that an Icelandic lager would be towards the top of the European Challenge ladder? Certainly not me! If you would like to try this speak to me in the next week or so, it'll go fast!